New Reports Of Hackers In Democratic Party Computer Systems The Clinton campaign says its systems were not hit but that a program it uses was in the party's compromised system. The Democratic Congressional Campaign Committee was also hacked. 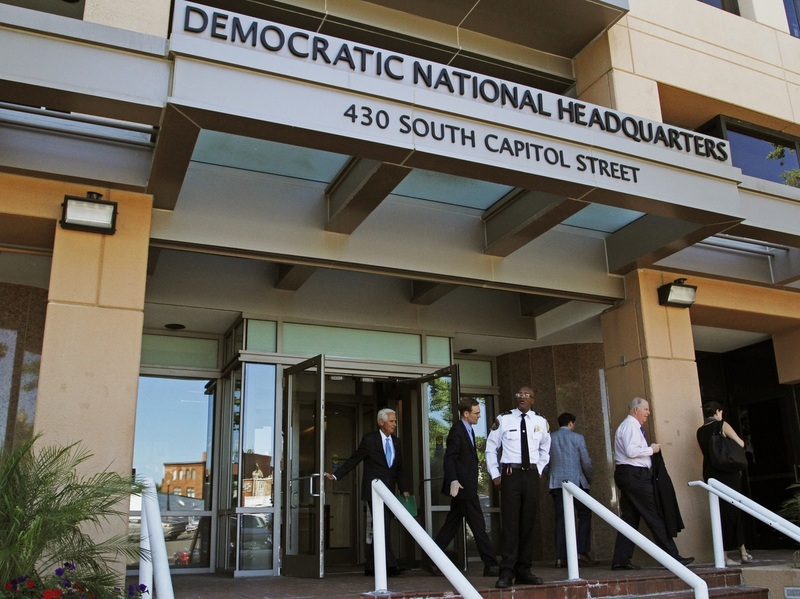 The Democratic National Committee headquarters in Washington, which also houses the Democratic Congressional Campaign Committee. The computer networks of both the DNC and DCCC have been hacked; investigators say Russia is the likely culprit. The Hillary Clinton campaign says an analytics program it uses was hacked as part of the previously reported intrusion into the Democratic National Committee computer system. The campaign says it doesn't believe its own systems were accessed. The FBI has issued a statement saying it is looking into the reports. Another branch of the Democratic Party says it has been hacked. This time it's the Democratic Congressional Campaign Committee. The committee raises money and helps the party's candidates for the U.S. House. In a statement, DCCC press secretary Meredith Kelly confirmed it was the "target of a cyber security incident," which investigators say is similar to other recent incidents, including breaches of the Democratic National Committee's computer network. Russia is widely believed to have been behind that incident, which is being investigated by the FBI. The DCCC says it is cooperating with federal law enforcement as part of an ongoing investigation. It has also hired the cybersecurity firm CrowdStrike to assist in addressing the hack. CrowdStrike would not comment other than to confirm it was engaged by the DCCC. In June, the same company said it detected two separate breaches on the DNC's network. One, it said, was the work of "Cozy Bear," likely the Russian intelligence agency known as the FSB, the successor to the Soviet-era KGB. The other breach, CrowdStrike identified as "Fancy Bear," which the company says was the work of Russian military intelligence. The cyberattacks have become a campaign issue. The DNC hackers retrieved internal DNC emails and posted them last week on the website of WikiLeaks. Those emails showed party officials expressing a preference for Hillary Clinton over Bernie Sanders as the Democratic presidential nominee, even though the DNC is supposed to remain neutral during primary elections. That leak led to the resignation of DNC Chair Debbie Wasserman Shultz this week. Republican presidential nominee Donald Trump then stirred up more controversy when he cited the DNC hack and called on Russia to find emails deleted from Hillary Clinton's private email server when she was secretary of state, a comment he later said was sarcastic. Earlier this year, Director of National Security James Clapper warned that political campaigns would be likely targets of hacking attempts, a prediction that appears to be coming true.